This is a 5-week course offering for adults (16 and up). 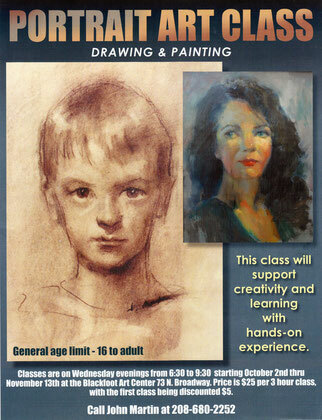 Come and see John create a live model portrait and ask any questions you have about his new class. Meet the artist, mingle with other local artists, and enjoy refreshments. You can also pre-register for the Portrait Art Class before it fills! Join us every Wednesday afternoon for an exciting new project, just for adults! Learn watercolor, soft or oil pastel, drawing from observation, collage techniques and more. As an option, you can bring your current art project and work among friends. You will receive the support and encouragement of the art center staff and fellow artists. 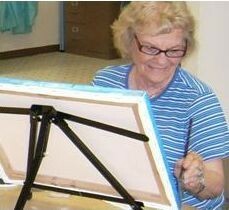 Open Studio adult beginner art class is held every Wednesday afternoon from 1:00 to 3:00 pm for anyone 16 up. Cost is just $15.00 per class, or $20.00 if you use our art supplies. Just $10 per class through May 31, 2019! Please contact the Art Center ahead of your first class session to receive your discount. At times, we offer specific Adult Open Studio Courses. Please see below for our upcoming "All About Color" Open Studio Course!